GE G8T5 Germicidal Fluorescent Lamp - Description: Bulb: T5 - Base: Miniature Bi-Pin (G5) - Primary Application: Germicidal; Speciality - Bulb Finish: Clear - Rated Life: 7500 hrs - Bulb Material: UV transmitting glass - Wattage: 8.0 - Lamp type: Linear Fluorescent - Manufacturer: GE - Part number: 11077. Germicidal lamps use a special glass that transmits 254nm energy that inactivates bacteria, viruses, molds, and cysts by preventing replication. 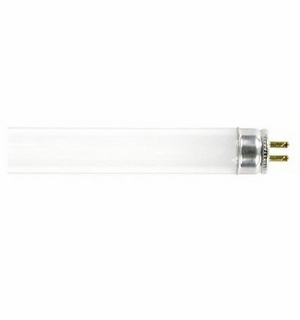 GE G8T5 Germicidal Fluorescent Lamp - Description: Bulb: T5 - Base: Miniature Bi-Pin (G5) - Primary Application: Germicidal; Speciality - Bulb Finish: Clear - Rated Life: 7500 hrs - Bulb Material: UV transmitting glass - Wattage: 8.0 - Lamp type: Linear Fluorescent - Manufacturer: GE - Part number: 11077.